The contact between Latin and Old English started before Anglo-Saxon came to England, since Germanic tribes had already acquired many Latin words. The population also learned Latin words from the Celts. A century and a half later, Roman missionaries introduced Christianity and an extensive adoption of Latin took place. The character of the words (religious, Germanic) is key in order to trace back their origin. A number of words found in Old English and Old High German can hardly been borrowed before the Anglo-Saxons migrated to England; ‘copper’, which is rare in Old English, was borrowed on the continent (it can be found in more than 6 other Germanic languages). We also find a clue of the origin of the borrowing in the phonetic form of a word; changes can be dated with some definiteness. In Old English –as in most Germanic languages- a change named ‘i-umlaut’ affected certain diphthongs when followed by ĭ or j. Thus, in words such as baƞkiz (benc > bench) or mūsiz (mȳs > plural of mūs, ‘mouse’), taking into account that the change happened in the 7th century, it indicates that the Latin word had been taken into English by that time. That also indicates that monēta (munit in Old English > mynet, Modern English ‘mint’) is an early borrowing. In many words, the evidence for their date of acquisition is funished by the sound changes of Vulgar Latin. Wine-trade with the Romans; wīn > wine; must > new wine; eced > vinegar; flasce > flask, bottle (note the similarity with Modern German Flasche); cyrfette > from Latin cucurbita, gourd; sester > jar, pitcher. Domestic life; cytel > kettle, from Latin catīnus; mēse > table; scamol > from Latin scamellum, bench, stool; tepet > from Latin tapētum, carpet (note Modern German Teppish), curtain; pyle > from Latin pulvinus, pillow; pilece > from Latin pellicia, robe of skin; sigel > brooch, necklace. Others; cycene > from Latin coquīna, kitchen; cuppe > from Latin cuppa, cup; disc > from Latin discus, dish; cucler > from Latin cocleārium, spoon; mortere > mortar, vesse; līnen > līnum, flax; līne > from Latin līnea, rope, line; gimm > from Latin gemma, gem. Foods; cīese > cheese; spelt > wheat; pipor > pepper; senep > from Latin sināpi, mustard; cisten > from Latin castanea, chesnut; cires > from Latin cerasus, cherry tree; butere > from Latin būtyrum, butter; ynne > from Latin ūnnio, onion; plūme > plum; pise > from Latin pisum, pea; minte > from Latin mentha, mint. Building; cealc > chalk; copor > copper; pic > pitch; tigele > tile. Miscellaneous; mūl > mule; draca > dragon; cāsere > Emperor; Sæternesdæg > Saturday; Cirice > to Latin from Greek kyρikòν > church. Adjectives; Sicor > from Latin securus safe; calv > from Latin calvus, bald. Words through Celtic transmission; as we have noted in the previous blog entry, there are a considerable amount regarding place-names. An important word -in terms of subsequent word-formation- that the Celts borrowed is ceaster, from Latin castra and it is very common in toponyms; Chester, Colchester, Dorchester, Manchester, Winchester, Lancaster, Doncaster, Gloucester, Worcester. Some of these places were Roman camps, but not all of them. The English attached it freely to a place intended for habitation. A few other words are thought to belong to this period; port > from Latin portus, harbour, gate, town; munt > from Latin mōns, mountain; torr > from Latin turris, tower, rock; wīk > from Latin vīcus, village. 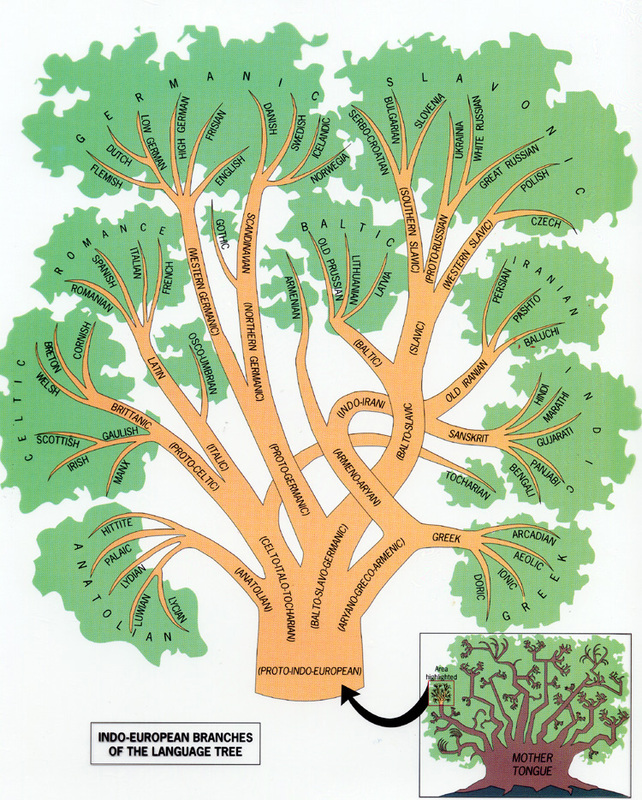 Within the Indo-European family tree, surviving languages show various degrees of similarity due to their common origin, bearing a more or less direct relationship to their geographical distribution. They fall into eleven different groups: Indian, Iranian, Armenian, Hellenic, Albanian, Italic, Balto-Slavic, Germanic, Celtic, Hittite and Tocharian. Germanic, which antedates the first written records, can be divided into three branches: East Germanic, North Germanic and West Germanic. East Germanic comprises languages such as Gothic – which accounts for the first written record of Germanic, in the shape of runes in Scandinavia – Burgundian and Vandalic. 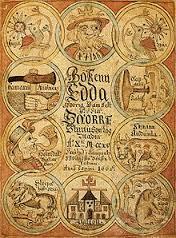 North Germanic, which gave way to Old Norse, or early Scandinavian and from which two branches grow out of dialectal differences; on to the East, developing into Swedish and Danish and the other to the West, developing into Norwegian and Icelandic -the most literary of all, with an important body of heroic literature such as the Elder or Poetic Edda compiled by Snorri Sturluson (12th-13th centuries) -. Finally, there is West Germanic, to which English belongs, and which separates in High German and Low German due to the operation of the 2nd Sound Shift, by which West Germanic voiceless plosives /p, t, k/ and voiced plosive /d/ changed into other sounds in AD 600 in the southern mountainous Germanic area, but not in the lowlands (North). This phenomenon of unknown origin is often assumed to have its origin in the contact with non-Germanic population due to the migration of foreign tribes into Germanic territory. Thus, High German is the origin of Rhenish, East Franconian, Bavarian and Alemannic, and Low German divides into Old Saxon (essential constituent of Plattdeutsch), Old Low Franconian (basisfor Dutch and Flemish), Old Frisian and finally, OLD ENGLISH. Old English is not entirely uniform, though. It comprises four dialects: Northumbrian, Mercian – each bearing their distinctive features and their common ones -, West Saxon and Kentish. Nearly all Old English literature preserved in manuscripts come from West Saxon, which attained the position of literary standard and was eventually cut short by the Norman invasions, giving way to a standard based on the dialect used in the East Midlands.